I read this in issue format, as volume 1 is not released until November 2015. I definitely did not pick the correct place to start reading the whole Spider-Verse event. From what I can tell the background for this character and universe is introduced in earlier events, so I found myself playing catch up a lot as I was reading this. However despite that, I really enjoyed reading these issues. This Gwen is from a different universe, where instead of Peter Parker being bitten by a radioactive spider, it was Gwen Stacy. Overall, these issues weren’t exactly plot-heavy. There wasn’t really that much happening. But still, there was a lot to love. Gwen Stacy has always been one of my favourite characters from the Spider-Man world, and I really enjoyed reading her as a main protagonist. At first I had real trouble getting into this, however as the issues went on and relationships (especially Gwen and her father) began to flesh out, I really began enjoying myself. This is probably my favourite father-daughter relationship I’ve read, with the execption of Babs and Commissioner Gordon. I also really enjoyed the relationship with her band mates. The fact that Gwen is a drummer in an all-girl rock band The Mary Janeswas such a fun added extra to this series that I really found narrowed in my enjoyment. The artwork, however, would have to be my favourite part of these comics. The colour palette absolutely drew me in. The purples and pinks worked so well together, but with the hints of orange and blue I was completely smitten. I’m a sucker for a nice colour palette. And I absolutely love Gwen’s costume. It is able to capture her body and physic without being demeaning or showing hideous amounts of skin, which I absolutely love is becoming more common for female heroes in comic series. In the end, I found this volume somewhat underwhelming. 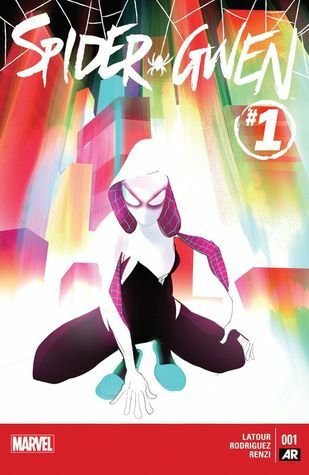 But overall I did really enjoy reading them and I will be continuing to pick up anything else Spider-Gwen and going back to check out the other Spider-Verse issues.